FLAVIO ALMERIGHI was born in Faenza, Italy, in 1959. As a boy he began writing poetry and got involved in radio and the theater. The best year of his life was 1976, when he read The Odyssey over the summer. His daughter Caroline says her father is her favorite poet. Among the poets he considers his most important influences are Guillaume Apollinaire, Pedro Pietri, Peter Sinfield, Pasquale Panella, Dario Bellezza and Amelia Rosselli. Outside of poetry, his life is taken up with the aridity of numbers. His poetry collections are: Allegro Improvviso / Sudden Allegro (Ibiskos 1999), Vie di Fuga / Escape Routes (Aletti, 2002), Amori al tempo del Nasdaq / Love in the Time of Nasdaq (Aletti, 2003), Coscienze di mulini a vento / Consciousnesses of Windmills (Gabrieli, 2007), durante il dopocristo / during the afterchrist (Tempo al Libro, 2008), qui è lontan / here it's far away (Tempo al Libro, 2010), Voce dei miei occhi / Voice of my eyes (Fermenti, 2011), Procellaria / Storm Petrel (Fermenti, 2013), Caleranno i Vandali / Drop the Vandals (Samuel, 2016). 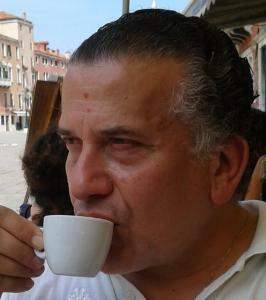 Some of his works have been published in the literary magazines Sheet Clandestino, Prospektiva and Tratti. He is a regular contributor to the virtual magazines Versante ripido (Steep Slope) and L'ombra delle parole (The Shadow of Words). 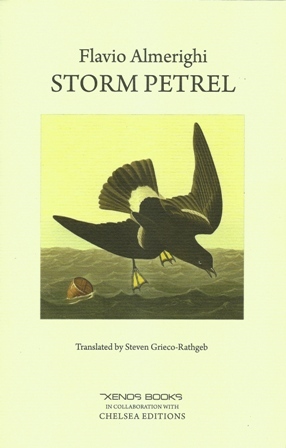 STEVEN GRIECO-RATHGEB is a Swiss-born poet and translator who writes in Italian and English. In 2015 he translated Giorgio Linguaglossa, Three Stills in the Frame: Selected Poems, 1986-2014 and in 2016 Roberto Bertoldo, Victims' Cram: Selected Poems 1965-2015, both for Chelsea Editions. "In Almerighi's lean style we detect a subtle and sparing use of words which the poet has been careful not to educate or sanitize; they are revealed little by little in a casual, ironic manner, while he himself is busy with 'objects' (i.e., the optimal place, 'utopia stuffed with scholastic eros') among bursts of laughter and wry take-offs on the meaningless blabber (the non-place) which we have come to accept as our daily speech." ~ From the Critical Note by Giorgio Linguaglossa. siano morti o ancora vivi. whether they're dead or still alive. see everything from a distance. the idea of "back from holidays"